My panel went well. Packed house, 400+ peeps, standing room only. 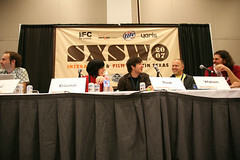 Having Internet rock stars on the panel probably had a little something to do with that. Hoping someone shot video of it, I don’t think SXSW did anything official. PC Magazine did a nice summary of the major points we hit. No, we were not the only panel to drink ourselves silly throughout. I think MJ downed a bottle of Jack on her panel.